What’s the Point of Having a Good Firefighter Bio? There is always a good competition at any fire department career. Along with your physical and mental abilities, you must shine yourself with your past experience by writing a convincing bio. Writing good Instagram bios may look simple and straightforward, but it essentially involves a lot of thought and if you’re using Instagram for fireman biography, it’s surely important for the first impression to be a good one! Catching the appropriate attitude inside your proficient bio is extremely important. You don’t have to look too expert and pretentious, but you also need to satisfy instead of insult. You need to have a balance between expert and spirited so that you can display your unique personality in a way that is not off-putting. For writing this wonderful piece of art, our professional bio writers are available to give you the best bio you’ll ever have. Our experts will assist you with the best of their skills. Whether its firefighter Instagram bio writing or simple firefighter biography, our experts are ready to glow your chances by writing a professional bio. You can use this for your employment purposes as it will definitely help you to shine out and increase the chance for a wonderful job. To write an effective biography for a firefighter, or when writing social media bios, it is essential that you determine the purpose of the bio and who the audience will be. The firefighter bio may be used for finding employment, either as a firefighter or in another industry. It can be used to establish the credentials of an author or speaker on the topic of firefighting or used on a fire stations website. A good bio will target the particular audience it needs to in order to achieve its intended purpose. The biography is a summary of a firefighter’s career and it won’t be possible to include everything. Choose the information that best contributes to achieving your goal when deciding what to include in your bio. The information you include in your bio will depend a great deal on the purpose it is intended for. If the biography is being written to apply for another firefighting position you will want to include your employment history as a firefighter, training you have received, and any special recognition or awards you have earned. There are often as many as a hundred or more applicants for a single firefighter opening. A short paragraph containing some personal details should be included as those reviewing applicants are looking not only at your qualifications but for how well you will fit in. A biography for a firefighter transitioning to another field would also include employment history but the focus would be more on transferable skills that they have. Personal information would not be as big a factor in the bio. Introduction: Begin by providing your name and what you do. Provide your current position and some of your main duties and responsibilities. A few words about why you chose to be a firefighter may be included. Professional experience: Discuss your employment history as a firefighter beginning with your most recent position and working your way back. If you have received any special recognition or awards they should be included. Education: Discuss the training you have received and any special certifications you have earned. Personal information: Include a few sentences that provide some personal details on things like family, hobbies and other interests. Avoid getting too personal. Write clearly and concisely. Professional bios are relatively brief so don’t use any unnecessary words and get directly to the points you want to make. Keep your audience and purpose in mind. You don’t have to write a bio for everybody. Focus on the particular audience the bio is intended for and write for them. Revise and proofread your biography. It may take several revisions until the bio is just how you want so don’t leave it until the last minute. Proofread for spelling mistakes and grammatical errors. Writing your own professional bio isn’t easy. Many people aren’t comfortable writing about themselves or don’t know how to write an effective bio. 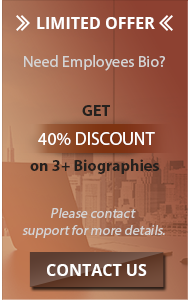 If you are unsure of the best way to write your biography our service can do it for you. We specialize in writing all types of biography from a firefighter biography to a judges biography. For an effective firefighter biography that makes a favorable impression, contact us and take advantage of our bio writing expertise!